Many clients are so satisfied with our fence work for them that they turn to us when they need other functional and decorative additions to their yards. 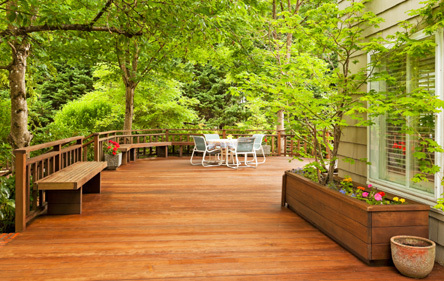 That’s why we offer professional deck design and installation, as well as, a variety of other property enhancements. We handle everything from design to site prep and installation. Our custom decks are designed to last for years while enhancing the beauty and usability of your property. They also add to your property’s eye-appeal and resale value while giving you additional usable space where you can entertain or spend time with your family. Decks are a great way to take full advantage of the outside dining and entertainment possibilities of the Southern lifestyle. In architecture, decks are simply defined as an outdoor floor attached to a house. However, a well designed deck can be so much more; capture a view, turn a tiny sunlit space into an outdoor room or even tame a slope by transforming unusable yard space into a livable extension of your home.